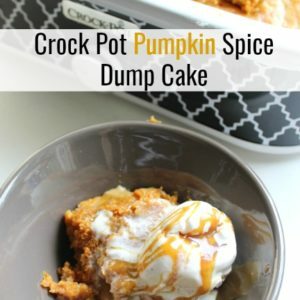 If you make ANYTHING on MyHeavenlyRecipes.com this fall, let it be this Crock Pot Pumpkin Spice Dump Cake! Let me just describe the flavors for a moment, because I’m still in Heaven right now after shooting and eating this video for ya’ll! The Pumpkin flavor is just a hint and not to powerful, the warmth paired with the melting vanilla ice cream is just pure perfection and then the caramel just puts everything over the top! If you enjoy nuts you could totally top this with some pecans or walnuts to just put this Crock Pot Pumpkin Spice Cake off the charts good! I don’t know what it is, but, I feel like whenever you have pumpkin you’ve gotta spice it up with Nutmeg, Ginger and Cinnamon. It’s like just a rule that I have in my head! 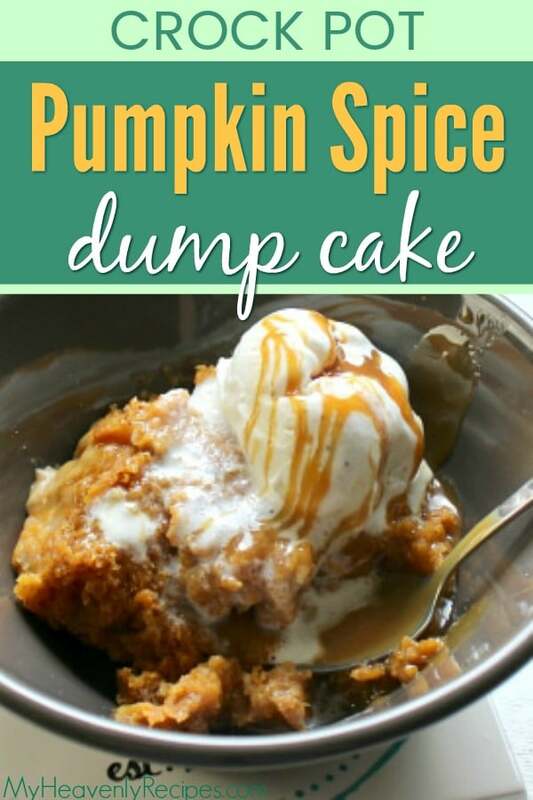 Last year I had this idea for a Pumpkin Spice Dump Cake recipe. I’ve been on a “Dump Cake” fix here lately. This is my first Dump Cake Recipe that I’m bringing to the site. So if you like them please be sure to subscribe so that you can receive the free emails I send out when I have new recipes on the site! Dump cakes are seriously just to easy and they also leave your house smelling AMAZING! I love quick and easy recipes and especially ones that I don’t have to “babysit”! I do that enough during the day. You might also like to try the Pumpkin Coffee Cake from Buns in My Oven! Before we go any further whenever I use my Casserole Crock Pot I get questioned about it. Maybe it’s because we are use to the round or oval shaped, but, I really think the Casserole makes for a better cake and it also is great for a few other recipes I’ll be sharing 😉 You can grab the Casserole Crock Pot on Amazon for under $40! I’m up to 3 Crock Pots in my house now. You simply can’t have to many, especially during the fall! Oh and let me just tell you something RAYQUICK (that’s real quick!) the smell of this cooking in your home will have you wanting to just go over to the Crock Pot and start licking it clean. But, please, please don’t do that! You’ll burn your tongue and then you can’t enjoy this Crock Pot Pumpkin Spice Dump Cake recipe to it’s fullest potential…K? In a Crock pot dump in white cake mix, nutmeg, ginger and cinnamon and whisk. Next dump in pumpkin and condensed milk and mix without mixing in cake mix. Cook on high for 2 hours and stir. Continue cooking for another 2 hours until cake has set. Serve warm with vanilla ice cream, salted caramel and nuts! 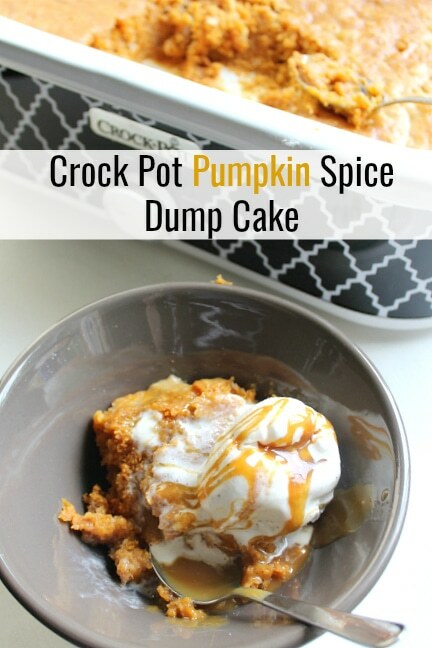 Click below for our printable version of this Crock Pot Pumpkin Spice Dump Cake recipe! A quick and easy dessert recipe for fall. This Pumpkin Spice Dump Cake is made in the Crock Pot and will have you wanting more. This cake sounds heavenly! And so easy to make too! Oh it is and leaves your house smelling like fall! I hope you’ll give it a try sooner than later. Can u use a slow cooker for this cake? Yes! I used the Crock Pot Casserole for my recipe. I ordered it off of Amazon –> https://amzn.to/2hzSTQY (aff). I tend to use it for baking and the traditional round ones for everything else! You dump in the pumpkin and the condensed milk and mix without mixing in the cake mix? Do you keep it off to one side? A little confused by that. I don’t understand what it means when it says to dump in pumpkin and milk and mix without mixing in cake mix. How is that possible? Watch the video for how I do it. You can mix it all together, but, it gets super dry. Trust me that’s why I do it this way and not like how everyone does it! Hi Jennifer. Watch the video for how I do this or you can mix the pumpkin and milk together and pour it in, but, I try not to dirty dishes! Should I use my 2 or 6 quart slow cooker? Dying to make this!! The one I use is a 3.5 qt so you should be good on the 2. I would also recommend watching the cook time so you don’t burn it. This looks amazing! I’m featuring you as my rockstar pick on Creativity Unleashed this week! Aww yay! Thank you so much Kim! 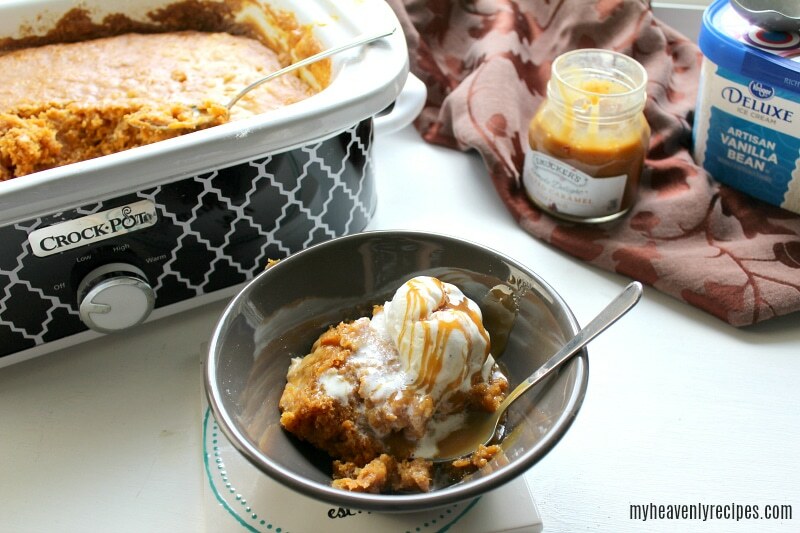 Pumpkin spice dessert and made in a Crock Pot? Absolutely! This is the perfect dessert for Thanksgiving or any autumn party. Thanks for sharing your recipe with us at Merry Monday this week! Oh this sounds amazing! I just made a loaf of pumpkin bread and now I’m wishing I’d seen this recipe – it sounds amazing (and I bet it smells amazing, too!). 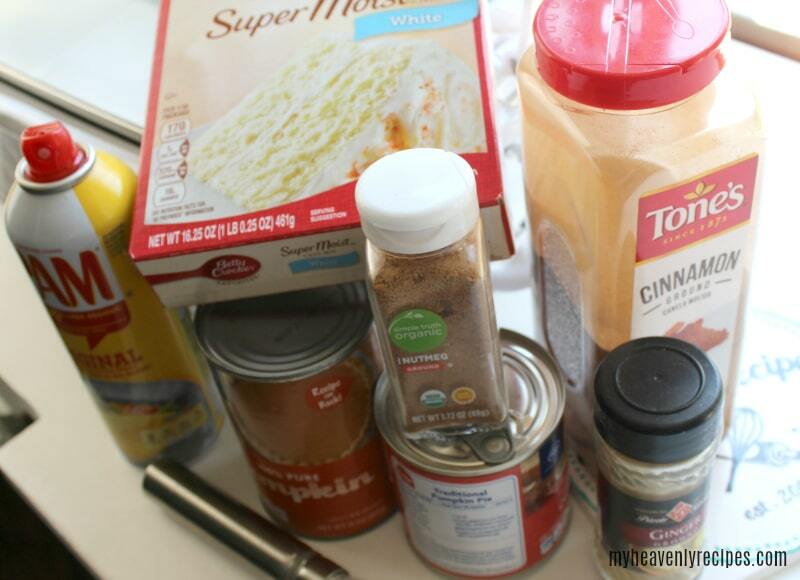 Thanks for linking up with Merry Monday this week; I’m featuring your cake at our upcoming party. Marci, your delicious recipe is on my Must Try List. Thank you for sharing it at the Talk Of The Town Party – you are my feature this week! See you Tuesday! This will help free up the oven for other things during fall gatherings. Thanks for sharing your easy dump cake recipe on Merry Monday. Pinned and featured it in a pumpkin roundup. Has anyone tried making this in the oven? I know we will not eat the whole things, and I hate to have to scoop it into another container to put it into the refrigerator. I have not tried putting it into the oven, but, you can! Just mix it all together like you would a regular cake! Bake and go! can you double the recipe and put it all in a 6qt crockpot? You sure can. It make take longer to bake, so please keep that in mind as it will be much thicker!